What if one day, all superheroes became disciples of Lord Buddha? How about chanting Buddhist sutras while saving the day? 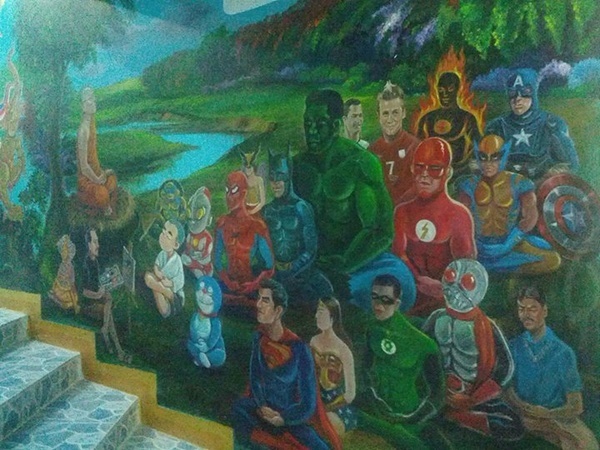 There is a temple in Thailand where superheroes are painted on the temple walls. This epic piece of wall art is at Bang Jak Temple in Nonthaburi province. Batman, Superman, SpiderMan, Wolverine, Green Lantern, the Hulk, and Captain America are all represented, amongst other famous icons like David Beckham, Doraemon, and more.